Confession: I maaaay have overbaked these. So they're a smidge overbrowned. Sorry. It's okay though because they still turned out AWESOME! 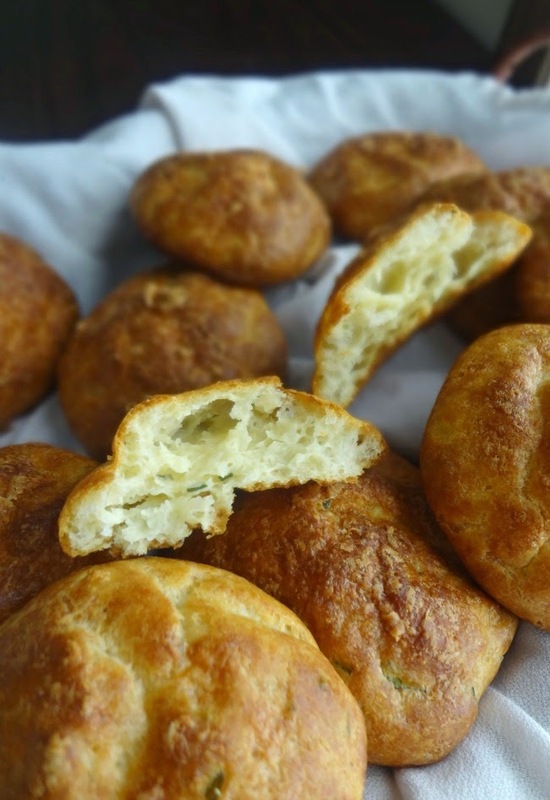 Gougeres are pretty much French cheese puffs, made with choux (the same sort of pastry that brings you cream puffs). 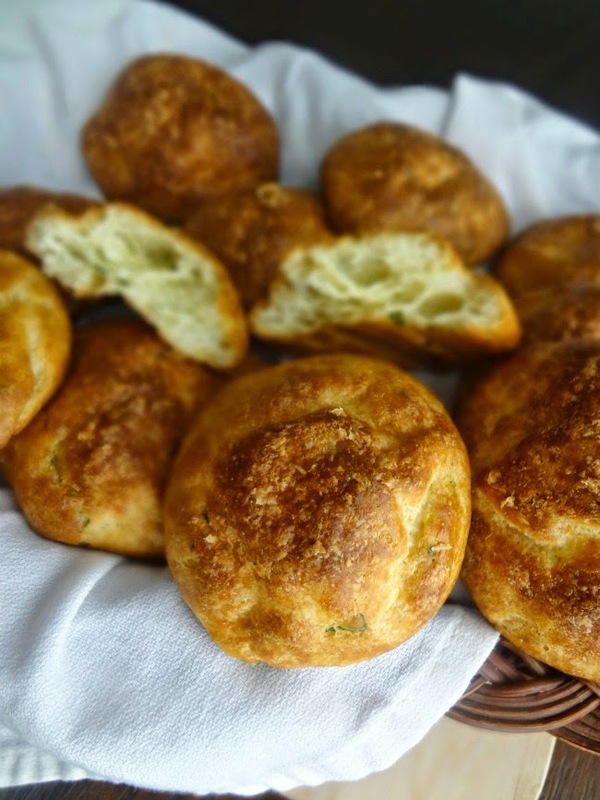 For these Gougeres I worked with what I had--which is Parmesan cheese and some chives and basil from my overflowing herb garden. But you can totally customize these to your preferences/what's in your kitchen! So here we have airy little mounds of heaven. They're all crisp on the outside and they taste like Parmesan and herbs and they're so light on the inside. 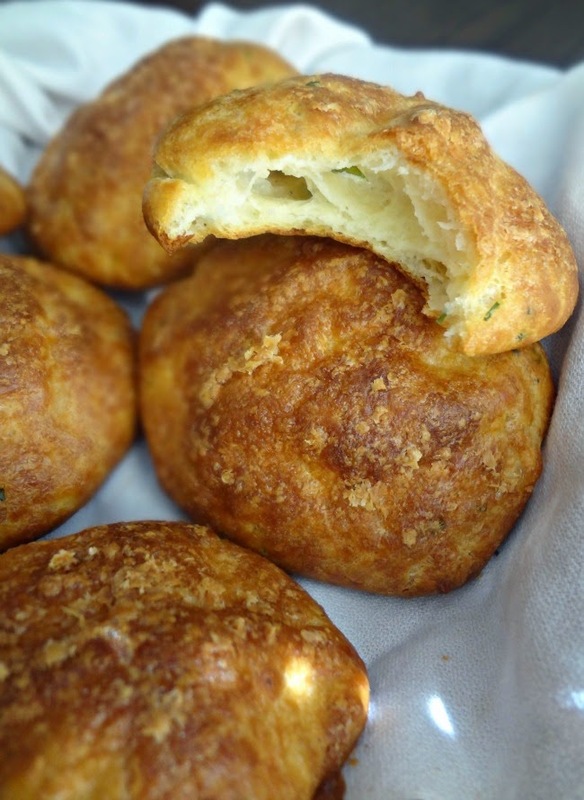 These gougeres are crazy addictive-I may have eaten the whole batch within an hour of baking them. Oops. It's ok, though. I can always make more. And maybe use cheddar and chives next time! ooooh yum! Make em. Trust me. They're so much easier than you'd think (don't let the French name fool ya) and they're whipped up crazy quick. 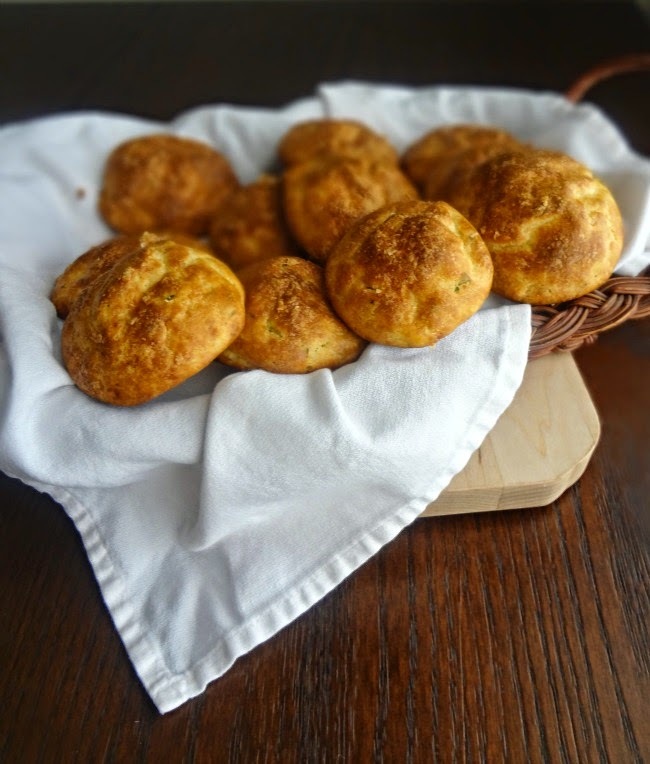 Gougeres are also the perfect thing if you're entertaining-instant "oooohs" and "ahhhs" for minimal effort! Huzzah! Preheat oven to 425F degrees and line a large baking sheet with parchment paper. In a medium saucepan, over medium heat, combine water, butter, salt, and pepper and heat until the butter is melted. Add all the flour and stir vigorously until it forms into a smooth ball. Remove from heat and allow to cool for 5 minutes. Add the fresh herbs and 2/3 cup of the grated cheese, stir until evenly distributed. Space circles of the choux about an inch or so apart on the prepared baking sheet. You can do this by scraping the dough into a pastry bag fitted with a wide plain tip and piping small cherry-tomato-sized mounds of dough, or you can use a 1 tbsp scoop or a regular spoon to drop dollops of dough onto the cookie sheet. (I did the latter because I don't have a piping tip or pastry bag). Sprinkle the top of each dough round with the rest of the cheese. Bake 10 minutes, then reduce the heat to 375F and bake 10-25 more minutes, until golden brown all over. Make ahead method: Once the dough mounds are on the sheet, you can either refrigerate the dough to bake later in the day or, for longer term storage, place in the freezer and then transfer the frozen gougeres to freezer bags (they’ll keep up to 2-3 months frozen). If using the frozen puffs, add an extra 5 minutes(ish) to the baking time. Bites of airy, cheesy, goodness.